After trying mawa malpua successfully, I prepared this instant, easy rabri recipe to serve with malpua. Its a quick version with just 3 major ingredients using microwave. It can be done in 6 minutes. Basically Instant rabri can be prepared using milk powder, ricotta cheese, khoya or even with condensed milk and corn flour. But today I have used Paneer / Chena, Milk and condensed milk to make this instant rabdi recipe. I followed Tarla dalal’s recipe. It came out really well. I won’t say its taste is equal to the authentic rabri, but it tasted good when served chilled. I used store bought paneer. 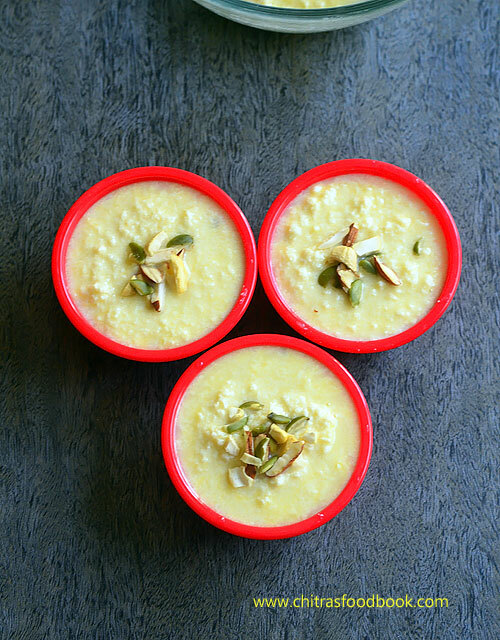 This rabri tastes even better when you make it with fresh chena. 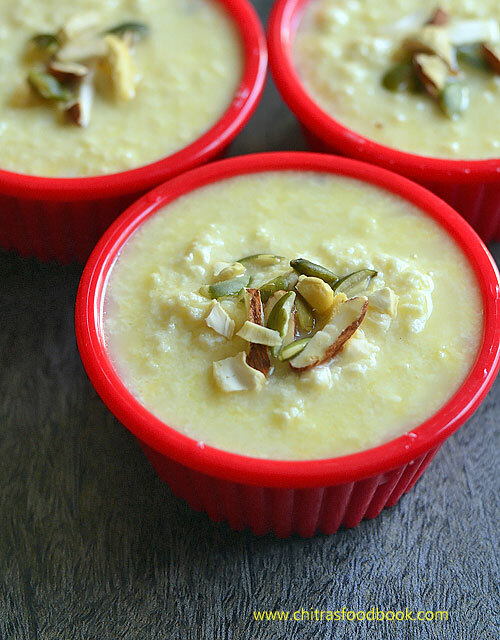 If you are craving for rabri, you can make it this way and enjoy instantly. Lets see how to make easy rabri recipe in microwave under 6 minutes with step by step pictures. 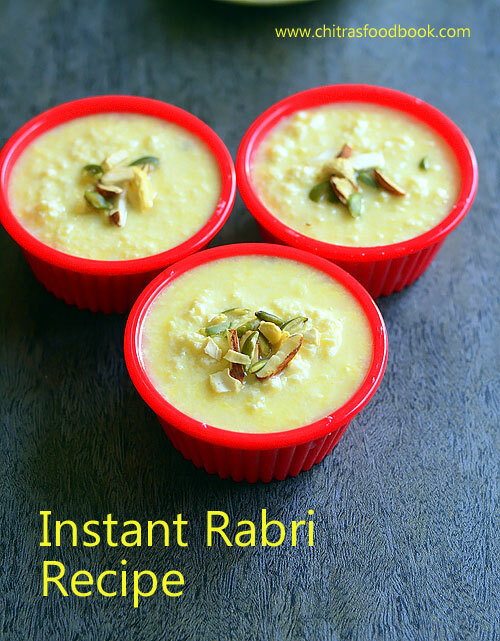 Instant rabri / rabdi recipe using microwave in 6 minutes. In a microwave safe bowl, take milk, condensed milk, grated paneer,cardamom powder and rose water. Mix well and microwave in high power ( 800W) for 6 minutes. Mix it once in the middle after 3 minutes. After 6th minute, remove the bowl. Mix well. Transfer to serving bowl. Garnish with chopped nuts. Refrigerate for an hour. Serve chilled. Grate paneer and set aside.In a microwave safe bowl, take milk. Add grated paneer, condensed milk, cardamom powder and kewra water or rose water. Mix well with a whisk or ladle.Microwave in high power at 800W for 6 minutes in total. Open it once in the middle at 3 minutes. Mix well and again cook for 3 minutes. Remove, mix well and transfer to serving bowls. Garnish with chopped nuts. Refrigerate for 1 hour and Serve chilled. Add more condensed milk if you need more sweetness. Kewra water is optional. You can use rose water or saffron instead. Rabri thickens after refrigeration. So you can add some milk to adjust its consistency while serving. Try this easy, yummy instant rabri recipe for festivals and special occasions.Enjoy it serving with malpua, gulab jamun !